When Chris Vanocur speaks, I listen. So when I bumped into the ABC 4 newsman at a City Weekly party and he pulled me aside to bend my ear about Baxter’s, I knew it was time to make like a bakery truck and haul buns to the Gateway’s newest eating establishment. With Baxter’s American Restaurant, the owners/partners/management—which includes Peter Burke and Tad Dugan, holdovers from the original Butterfly—have bent over backwards to insure that their restaurant does not intimidate. Prices are a little lower. The ambiance is more comfy and less trendy. The food is updated American comfort cooking. In four visits over the course of two weeks, I wasn’t intimidated at Baxter’s once. Like Butterfly, Baxter’s has lots of pop and eye appeal. It’s a gorgeous dining space with an inviting bar area that includes sofa seating and ought to become the default location for après-work cocktails in the area. For diners, there are booths, standard tables and a couple of four-tops with Barcalounger-size overstuffed chairs and cushions. The latter brings a whole new meaning to the notion of comfort food. In the corner just to the left of the bar is a small table with a dog bowl on it. That’s Baxter’s table. Who is Baxter? Well, Baxter might be a dog … or he might not be. It’s what Baxter’s executive chef Joseph Davis calls a conundrum—a term, incidentally, that I’ve never heard another chef utter. Whatever or whomever Baxter actually is, well, that’s all part of the playfulness of Baxter’s, the restaurant. This is a place where you can order “Bad Hair Day” halibut, “Not Your Mother’s” meatloaf and “A Very Large” hamburger. Start off, though, with Davis’ crispy calamari plate ($11.25), a big pile of battered and deep-fried squid rings and tentacles spiked with pickled jalapeños and served with a trio of home-style sauces: tartar, brava and Utah fry sauce. If you prefer your seafood “cooked” in lime and served chilled, try the layered ceviche ($8.95): chunks of calamari, halibut, shrimp and scallops steeped in a fresh and zippy lime-yuzu marinade with tomato and green chilies. I also enjoyed Baxter’s twist on the Caprese salad: A stacked tower of fresh mozzarella cheese, tomatoes and basil ($11.75) topped off with bright green pesto. One of the best bargains around is Baxter’s three-course express lunch. In addition to its regular lunch menu, Baxter’s offers the express lunch for a mere $9.95. It includes a cup of silky tomato soup with Shepherd’s Farm chèvre and basil oil or a salad, plus daily sandwich or wrap options and a choice of cheesecake, apple pie or brownie for dessert, along with iced tea or soda. That’s quite a deal, and the tarragon chicken salad sandwich with avocado relish is an especially tasty sandwich choice. But then, I haven’t had a Baxter’s sandwich yet that I didn’t like. The grilled ham and cheese ($7.95) is scrumptiously simple, served on crispy Texas toast “waffles” with a cup of tomato soup. The grilled meatloaf sandwich ($8.25) is meatloaf slices served on rectangular flatbread with caramelized onion, Swiss cheese, chipotle-tomato catsup and twice-cooked French fries—the best fries in Salt Lake City, by the way. Then there’s Joseph’s cheesesteak sandwich ($8.25), which is a modernist take on the Philly cheesesteak. It’s served open-faced on a square of flatbread about the size of an 8-inch-by-8-inch flooring tile, topped with tender hanger steak slices, melted smoked Gouda, peppers, frizzled onions, roasted tomatoes and greens. If you’re looking for classic cheesesteak, go to Moochie’s, but Joe’s updated version is delicious indeed. Good servers are hard to find, and Baxter’s expert management staff has lured a crew of experienced, professional workers into the fold. Not that there wasn’t a glitch or two, but overall, I was very pleased with table service at Baxter’s, from the reservation process onward. I did think, however, that the wine list could use improvement. There simply aren’t enough wine-by-the-glass options, and I’m surprised that a restaurant called Baxter’s American doesn’t feature American wines exclusively. There’s a perfect opportunity here for someone to design a wine list offering unique, off-the-beaten-path American wines which would set Baxter’s apart. But let’s get back to the food. 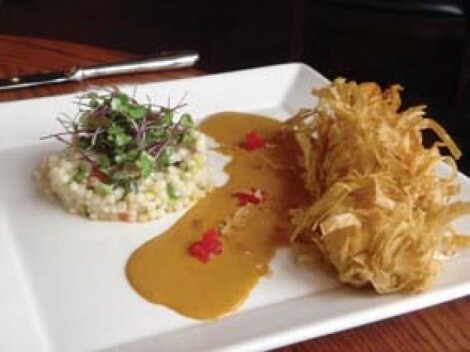 If you visit Baxter’s, make sure someone at your table orders Halibut Has a Bad Hair Day ($19.50). In essence, this is nothing more than fried fish and chips, but without the chips (there’s vegetable couscous instead). You just can’t help but be tickled when this hefty portion of Alaskan halibut, coated and deep-fried in a crust of shredded phyllo, arrives at your table. It just looks silly. Oh yeah, it’s absolutely delicious. I wish I could say the same for the chipotle-glazed baby-back ribs ($14.50 half rack/$27.95 full). My half rack was dry and chewy. In fact, the ribs I ordered tasted suspiciously like reheated leftovers from the day before (or maybe lunch). However, having sampled most of Baxter’s menu items, the ribs were the only disappointment, quickly remedied by biting into Chef Joe’s homemade sugar and cinnamon-dusted donuts, which transported me back to Mom’s donuts of my childhood. That’s a pretty good batting average, and one that hopefully will keep Baxter’s on the ground longer than Butterfly. BAXTER’S AMERICAN RESTAURANT 400 W. South Temple, The Gateway, 456-8999, BaxtersAmerican.com. Lunch Monday-Friday, Dinner Monday-Sunday, Sunday brunch.